Arteriovenous malformations (AVMs) are the lesions with direct communications between endothelial-lined artery/arteries and vein/veins bypassing the capillary bed [Figure 1].,,, Head and neck AVMs are reported to occur in 0.1% of the population of which extracranial accounts for only 8.1%. AVMs may be congenital or acquired.,,, Acquired AVMs are usually posttraumatic with previous history of injury, trauma or surgery with higher incidence of hemorrhage., Hemorrhage and disfigurement are common reasons requiring intervention in AVMs involving the head and neck region. The purpose of this case report is to describe the challenges in diagnosis of AVM and need for a prompt treatment of such cases. 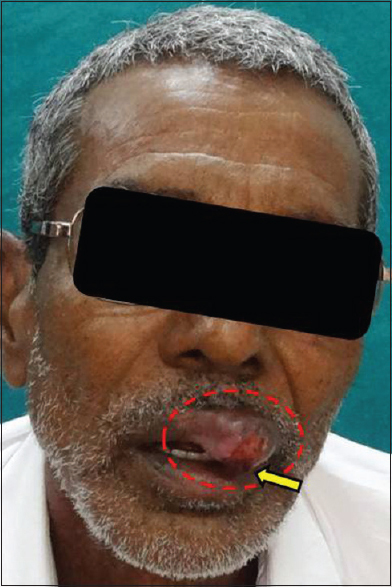 A 65-year-old male reported with chief complaint of bleeding from a painless swelling of upper lip for 1 month. The swelling began as a peanut size, 5–6 years ago and gradually increased to the present size [Figure 2]. Dental, medical or family history was noncontributory. General physical examination showed all vital signs normal. The patient was a professional trumpet blower since 35 years. On extraoral examination, upper lip appeared to be everted due to an oval swelling of size approximately 3 cm × 3 cm. Swelling was on the left side adjacent to midline, extending from vermillion border onto the labial mucosa. It showed central ulceration and bleeding points [Figure 2]. On palpation, swelling was soft to firm in consistency, with well-defined borders. It was immobile, nonreducible but slightly compressible. Swelling was pulsatile in nature with raised surface temperature. It bled on slight provocation. Based on the history and clinical findings, a provisional diagnosis of vascular malformation (VM) was made, and in differential diagnosis, pyogenic granuloma and vascular tumors were considered. The lesion showed brilliant enhancement on the arterial phase and early complete washout on the venous phase. 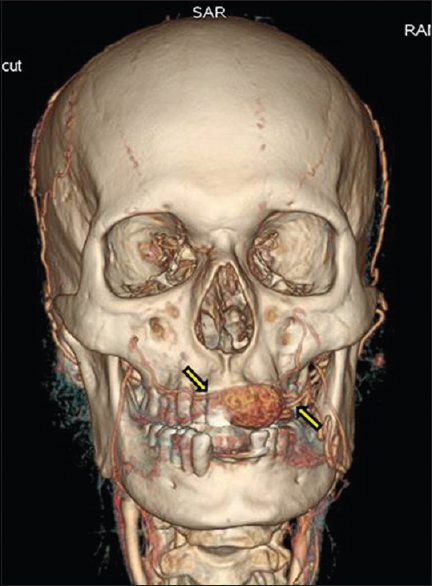 The lesion derived its vascular supply through angular branch of left facial and nasopalatine branches of bilateral facial arteries [Figure 3]. Taking all precautions, excision of lesion was performed under general anesthesia. A single grayish white globular mass (2.8 cm × 2.5 cm × 1.5 cm) was received. Outer mucosal surface was smooth while inner surface was reddish with multiple tiny vessels and areas of hemorrhage. Hematoxylin and eosin stained sections showed parakeratinized stratified squamous epithelium with varying degree of proliferation. Underlying connective tissue was loosely arranged with numerous thick- and thin-walled blood vessels arranged in a lobular pattern. Large vessels were surrounded by numerous proliferating small vessels. Proliferation of blood vessels was also seen in-between muscles. Mild degree of diffuse chronic inflammatory cell infiltrate was also present [Figure 4]. Based on clinicopathologic features, the lesion was diagnosed as AVM of the upper lip. The patient when reviewed after a month, surgical wound had healed completely. He was warned not to blow trumpet for at least 6 months. The patient was asymptomatic when reviewed after a year and had resumed his occupation of trumpet blowing. Vascular anomalies are heterogeneous group of vessel disorders that may affect any segment of the vascular tree; arteries, capillaries, veins, or lymphatics or a combination of these., Each anomaly is characterized by specific morphology, pathophysiology, clinical behavior and management approach. They constitute some of the most difficult diagnostic and therapeutic enigmas in the head and neck region. Hence, it is of utmost importance to establish a classification system  which will consider both diagnostic and therapeutic issues. Early classification given by Virchow and Wagner was according to the pathologic appearance of vessel. Vascular growths were subclassified into angiomas and lymphangiomas. The biologic behavior and natural history of the vascular lesions were not considered. 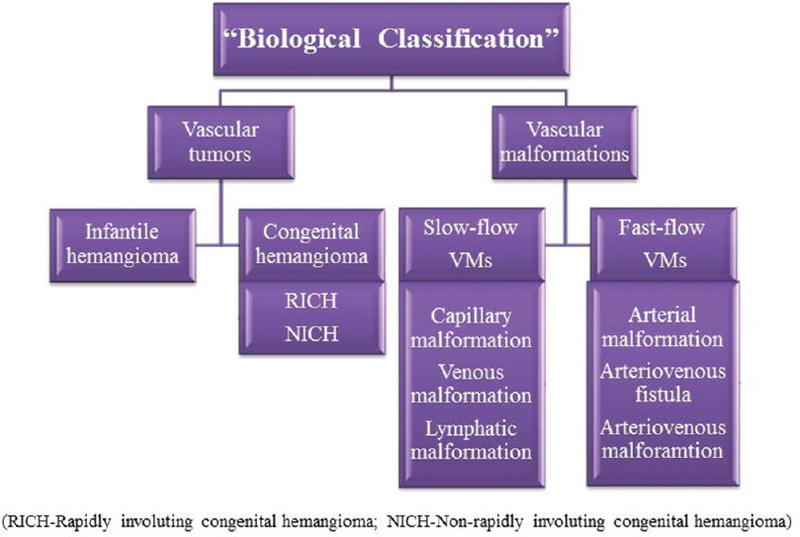 In 1982, Mulliken and Glowacki introduced a biological classification based on their clinical appearance, histopathologic features and biologic behavior into two major categories: tumors and malformations [Figure 5]. Vascular tumors affecting the head and neck region are common, particularly involving the jaws. On the other hand, VMs are rare  but when present are persistent and progressive in nature and can represent a fatal benign disease. Hemangiomas are the most common vascular tumors  and should be differentiated from VMs as therapy is different for each. AVMs are the most aggressive form of VMs, which can lead to significant deformity and functional impairment. Little is known about the origin and pathogenesis of AVMs. Although rare,,, most of the cases are sporadic. There are few inherited syndromes whose molecular genetics has been recently elucidated. A mutation in gene RASA1, expressing p120-Ras GAP, on chromosome 5q, has been identified in families with congenital malformations associated with AVMs. Trauma, ischemic event secondary to thrombosis, ectasia and hormonal changes (puberty and pregnancy ) can induce aberrant proliferation of the arteries-veins and trigger the manifestation of its troublesome symptoms. They may also occur following surgery, invasive diagnostic procedures or arterial aneurysm. When secondary to trauma, the lesion is usually supplied by a single vessel, as compared to the multiple vessels often seen with congenital etiology. AVM has been reported to develop in areas (buttocks) subjected to prolonged pressure in bedridden patients. Ischemic tissue damage due to prolonged pressure may lead to necrosis in the deep subcutis. Subsequently, in the process of tissue repair and angiogenesis, arteriovenous anastomoses may form, leading to bizarre lesion. In present case, ischemic tissue damage due to prolonged pressure by trumpet probably leads to development of arteriovenous anastomoses. AVMs are the most common type of clinically significant VM with predisposition in males twice frequently than females. The lesion is often recognized clinically between the ages of 10–30 years. They commonly involve the limbs but can occur in any organ of body. In the oral cavity, these can present at any site, but most commonly reported on anterior two-third of the tongue, palate, gingiva and buccal mucosa. Review of the available reported cases of acquired AVM in maxillofacial region summarized in [Table 1] showed predominance in the tongue (27.27%), and involvement of upper lip (9.09%) has been documented. The other sites included face, lower lip, premaxilla, maxilla and nasolabial region. The age distribution was ranging from 13 to 43 years (mean 29.62 years). Both genders were equally affected (M: F = 1:1). Typically acquired AVM presented as asymptomatic, soft-firm pulsatile swelling. Intraosseous VMs near the alveolar bone presented with pericoronal bleeding, mobile teeth and sometimes occlusal anomalies. The diagnosis of AVMs can usually be made correctly on the basis of clinical history and examination alone. The appropriate combination of noninvasive to minimally invasive tests should follow in order to confirm or exclude the clinical impression. A diagnostic aid for the evaluation of an AVM is a positive fine needle aspiration although this may not distinguish between high- and low-flow lesions. This technique is safe, efficient and reduces the possibility of fatal or profuse bleeding reported with biopsies. There have been recent advances in the evaluation of AVMs with imaging modalities. The first investigation usually performed is ultrasound and Doppler examination which allows immediate differentiation between a low- and high-flow lesion. Although CT scan can provide excellent pictures of the malformations and delineate the extent of involvement, it may not always differentiate AVM from other VMs. Magnetic resonance imaging has become the investigation of choice since it depicts the extent of these lesions and also allows differentiation between various VMs. Angiography is useful in poorly defined lesions and for embolization before surgery. It demonstrates the flow characteristics, feeding vessels and dangerous anastomoses. Radiographically, intraosseous AVMs appear as varying-sized osteolytic lesions with a “soap bubble” or “sun ray” appearance, often with indistinct borders. In the present case, the patient was diagnosed clinically as having a VM and further investigations including histopathology and imaging helped us to characterize the type of malformation as a high-flow AVM. The differential diagnosis of AVM includes vascular neoplasms, other VMs and in rare cases, other neoplasms. AVM should not be confused with hemangiomas which are characterized by an initial rapid growth of endothelial cells followed by spontaneous involution. Spontaneous involution of VM has never been reported. Hemangiomas are present at the time of birth and involute themselves and if persist in adulthood are known as residual hemangioma. Pyogenic granuloma and hematoma can be considered in differential diagnosis of AVM. They are nonpulsatile and histopathologically do not show mixture of arterioles and venules. Therefore, when evaluating a lesion with a clinical manifestation of pulsatile swelling and spontaneous bleeding, the first step would be to rule out a vascular anomaly before any intervention. Secondly, it is important to determine whether the lesion is a tumor or malformation. In most cases, differentiation between the two can be achieved by obtaining a proper history and physically examining the patient, while histopathology further provides confirmation. Thus, it is of great therapeutic importance to correctly classify and differentiate AVM from other vascular lesions. AVMs present a therapeutic challenge because of their hemodynamic characteristics and their growth modality. They have to be treated according to their histopathology, location and hemodynamic features as shown radiographically with angiography. Surgical resection is often associated with extensive blood loss, and an incomplete resection frequently leads to regrowth of the tumor to sizes that are often larger than its original size. Proximal ligation of the parent vessel is avoided as it is ineffective and may aggravate the problem making future endovascular therapy difficult. Based on relative indications, our patient was planned for preoperative embolization followed by complete surgical excision. Since then, the patient is on follow-up with no subsequent consequences. Acquired AVMs are quite rare in the head and neck region. They may present as a dental emergency due to their potential for uncontrollable bleeding when performing dental procedures such as tooth extraction, biopsy or during the natural exfoliation of a primary tooth. They may result in alarming hemodynamic manifestations such as venous engorgement, distal ischemia and high-output cardiac failure. Hence, early diagnosis and prompt treatment of such cases is must. A good clinical history with imaging usually delineates the lesion well and gives a chance to make a careful decision of intervention. The surgical management is complex and requires elaborate planning and multidisciplinary approach. This case report provides an overview of posttraumatic/acquired AVMs in the head and neck. Manjunath SM, Shetty S, Moon NJ, Sharma B, Metta KK, Gupta N, et al. Arteriovenous malformation of the oral cavity. Case Rep Dent 2014;2014:353580. Ramachandra S, Ippagunta LP. Acquired A-V malformations – A case report. Transworld Med J 2014;2:183-6. Petel R, Ashkenazi M. Pediatric intraoral high-flow arteriovenous malformation: A diagnostic challenge. Pediatr Dent 2014;36:425-8. 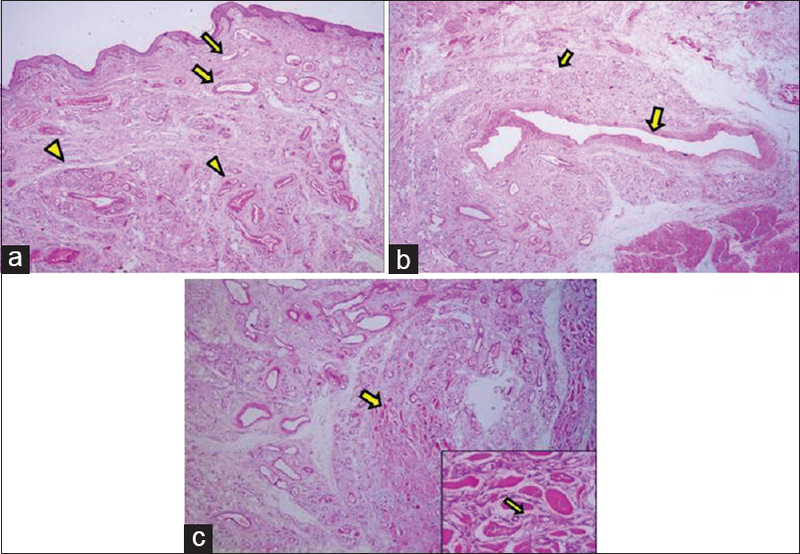 Yang CH, Ohara K. Acquired digital arteriovenous malformation: A report of three cases and study with epiluminescence microscopy. Br J Dermatol 2002;147:1007-11. Candamourty R, Venkatachalam S, Babu MR, Reddy VK. Low flow vascular malformation of the buccal mucosa treated conservatively by sclerotherapy (3% sodium tetradecyl sulfate). J Nat Sci Biol Med 2012;3:195-8. Mekkes JR, Pasch MC, Meijs M, Smitt JH. Acquired arteriovenous malformation induced by pressure: A case report. Vasc Med 2003;8:201-2. Lakkasetty YT, Malik S, Shetty A, Nakhaei K. Multiple vascular malformations in head and neck – Rare case report. J Oral Maxillofac Pathol 2014;18:137-42. ISSVA Classification for Vascular Anomalies. Approved at the 20th ISSVA Workshop, Melbourne; April, 2014. Maheshwari UM, Sahu SS, Khatu SP. Arteriovenous malformation of the cheek – A case report and Review of literature. Bombay Hosp J 2010;52:241-3. 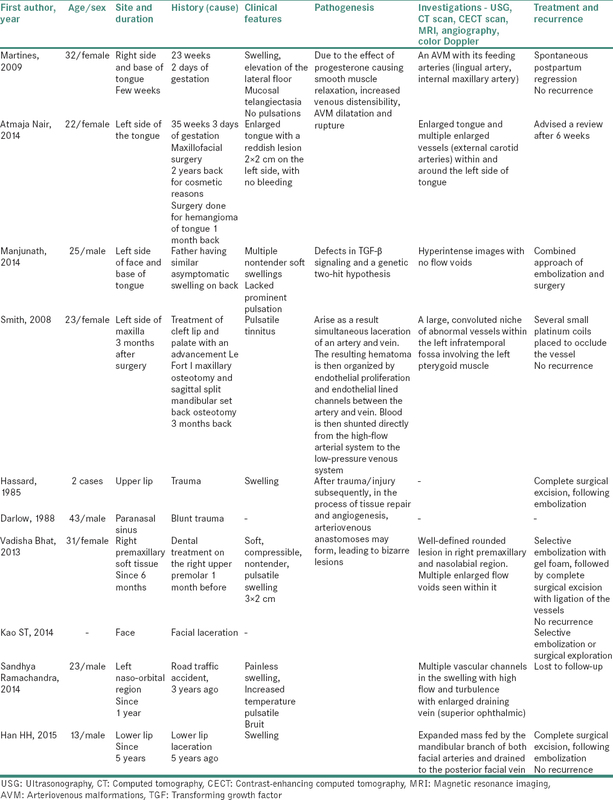 Bhat VS, Aroor R, Bhandary BS, Shetty S. Traumatic arteriovenous malformation of cheek: A case report and review of literature. Int J Otorhinolaryngol Clin 2013;5:173-7. Pujari M, Bahirwani S, Balaji P, Kaul R, Shah B, Daryani D. Arteriovenous malformation of tongue: A case report and review of literature. J Indian Acad Oral Med Radiol 2011;23:139-42. Kumar V, Abbas AK, Fausto N, Robbins SL, Cotran RS. Robbins and Cotran Pathologic Basis of Disease. 6th ed. Philadelphia: Elsevier Saunders; 2005. p. 1298-9. Marx RE. Oral and Maxillofacial Pathology: A Rationale for Treatment. 1st ed. Chicago, London: Quintessence Publishing; 2003. p. 433-5. Tan S, Marsh P. Arteriovenous malformation of the oral cavity: A case report. Oral Hyg Health 2015;3:1-4.